Though the past few months have been crazier than ever, there's been no shortage of inspiration. In fact, in between wedding planning, rebranding my blog & business (more to come on that! ), and dreaming about our honeymoon travels; I'm feeling more inspired than ever! I've been spending tons of time every week "creating" whether it's designing my website, creating DIY's for the wedding, or cooking up something with our garden veggies. 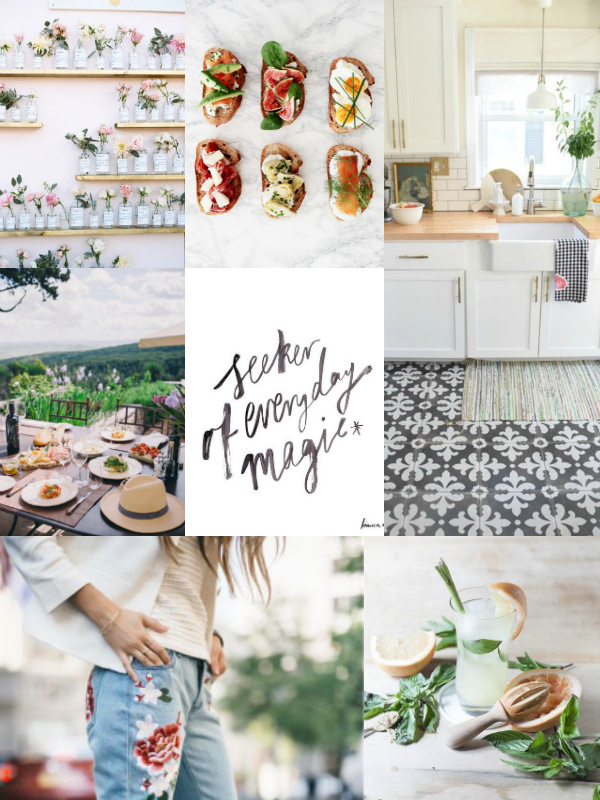 I thought I'd share a little bit of what's inspiring me most this month! I'm digging the light & airy with a mix of organic & eclectic. 1. These roses in vintage bottles make for such a stunning seating chart. I love the idea that very simple florals can be so beautiful. 2. Crostinis are one of our favorite things to make for dinner. We love coming up with creative combinations and using up whatever's in the fridge. 3. I'm all for the bright, white kitchen, but these eclectic floor tiles make a serious statement. 4. We can hardly believe that we're 40-ish days out from our honeymoon. Julia of Gal Meets Glam's Italian itinerary is giving me major wanderlust. 5. Lately it's been way to easy to get caught up in the hustle and bustle. I love this reminder to embrace the everyday "magic". 6. Something about these embroidered floral jeans totally reminds me of something I had in middle school, but I can't help but love their boho babe vibes. 7. I can hardly believe we've managed to keep our herb garden thriving all summer long. These basil, grapefruit & lemongrass cocktails are definitely happening before I switch to pumpkin beer!